The beautiful historic Patrick Henry Hotel will host the 2019 Friday Race Expo from 3 to 8 p.m. The event location is conveniently located at the start line AND across the street from Elmwood Park & Amphitheater. 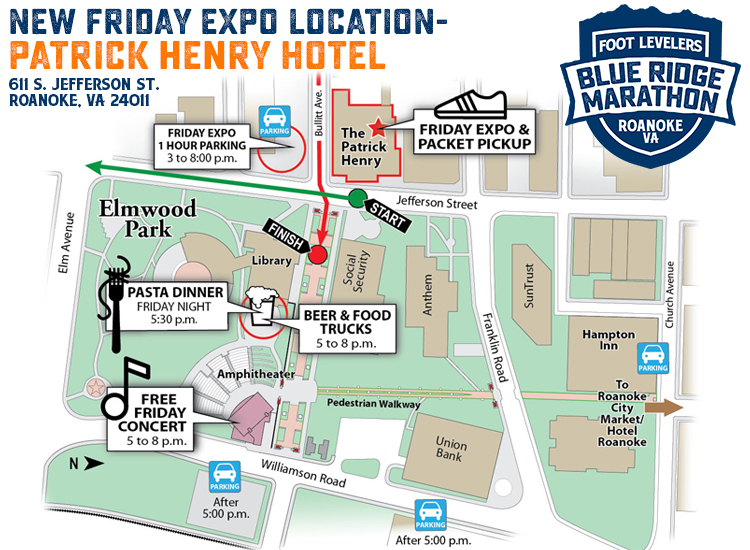 Elmwood Park (directly across Jefferson St.) will host the Friday Pasta Dinner and the FREE Friday Concert for all runners and spectators starting at 5 p.m. So grab your bib and swag, and head over to the show with food-trucks and craft beer. We strongly encourage all runners to pick up their own race packet at the Packet Pick Up and Expo on Friday at the Patrick Henry Hotel. It is important for runners to verify their data and make any necessary changes. However, if it is not possible for you to pick-up your own packet, you may have someone pick it up for you. That person will be responsible for verifying personal race information (name, age, birthdate, etc.) and MUST bring a copy of your drivers license (or valid photo ID). SHAKE OUT RUN WITH FLEET FEET: 7:30 a.m.: A free event & open to the public. This slow jog along the Roanoke River Greenway will start at Wasena Park (NEW location for 2019) just a couple miles from downtown. The 2019 event will feature special guests Jeff Galloway and Chuck Engle. Race organizers will also be there to answer questions. RACE EXPO & PACKET PICK-UP: 2 to 8 p.m.: Packet and timing chip pick up are at the Patrick Henry Hotel. Valid photo ID must be shown. If you are picking up for someone else you must have a copy of their ID. 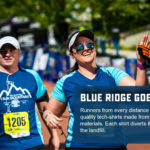 Last-minute runner items and Blue Ridge Marathon merchandise available. Day-before registrations available at packet pick up. $10 day-of processing fee applied to entry fee. Live music, beer and food truck in Elmwood Park on Friday at 5 p.m.! PASTA DINNER & VIP PARTY: 5:30 to 7:30 p.m. on the library mezzanine overlooking Elmwood Park. Tickets required, click the link above for details. FREE CONCERT IN ELMWOOD PARK: Doors open at 5 p.m. View the full line-up in Elmwood on Friday & Saturday of race weekend. RACE DAY PACKET PICK-UP: 5:30 to 7 a.m. For those who didn’t make it Friday night to the race expo. Race day pick-up is located on the amphitheater stage in Elmwood Park. BAG CHECK: Complimentary “bag check” located next to the stage in Elmwood Park. RACE START: 7:35 a.m. on Jefferson Street, up the hill from the Elmwood Park amphitheater. 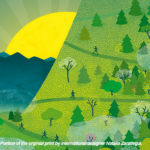 FINISH FESTIVAL: This isn’t really pre-race, but check it out because it’s going to be awesome! Monday (race week): 11 a.m.-2 p.m.
Wednesday (race week): 4 p.m.-7 p.m.
Friday (race week): noon-7 p.m.